Manchester United goalkeeper Edwin Van der Sar has signed a one-year contract extension at Old Trafford. The Dutchman, 39, is tied to the club until the end of the 2010/11 season. "I still feel good and am enjoying my football. I am looking forward to winning more trophies with this great team," said Van der Sar. Boss Sir Alex Ferguson said: "Edwin's professionalism and dedication to his job and the way he looks after himself has given him longevity in the game." Ferguson, who has been linked with a number of potential new keepers, including CSKA Moscow's Igor Akinfeev, added: "That longevity includes such great experience not just at United, but at Juventus, Ajax and on an international level. "We are absolutely delighted he is continuing for another year." Van der Sar is expected to feature in the Carling Cup final against Aston Villa at Wembley on Sunday having missed two months of the campaign following a knee injury and his wife becoming ill.
"This is a great club and I was shown a great deal of compassion and support during a difficult time in December and January for which I am extremely grateful," said Van der Sar, whose wife, Annemarie, suffered a brain haemorrhage before Christmas. 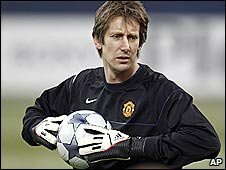 Since joining United from Fulham, Van der Sar has won three Premier League titles and the Uefa Champions League, but did not feature in Manchester United's Carling Cup final victory over Tottenham last season when understudy Ben Foster emerged as a penalty shoot-out hero by saving a Jamie O'Hara spot-kick.